Hey, wizards wear socks too! It's a simple fact that a lot of people forget, since those crafty spellcasters from Hogwarts have a magical solution to everything. But yes, every Harry Potter and his pals wear socks on a daily basis. It's something that reminds us how similar wizards and muggles. So, when you put these Harry Potter Ravenclaw knee-high socks, you can rest easy knowing that some wizard hanging out with The Grey Lady is doing the same. These officially licensed women's socks are made out of a polyester and spandex blend, so they stretch to fit various sizes. They're a jet black color with a stripe of Ravenclaw blue around the top and a House symbol from the Harry Potter movies on the side. They also have "Ravenclaw" on the side. These cozy socks are great for wizards and muggles alike! 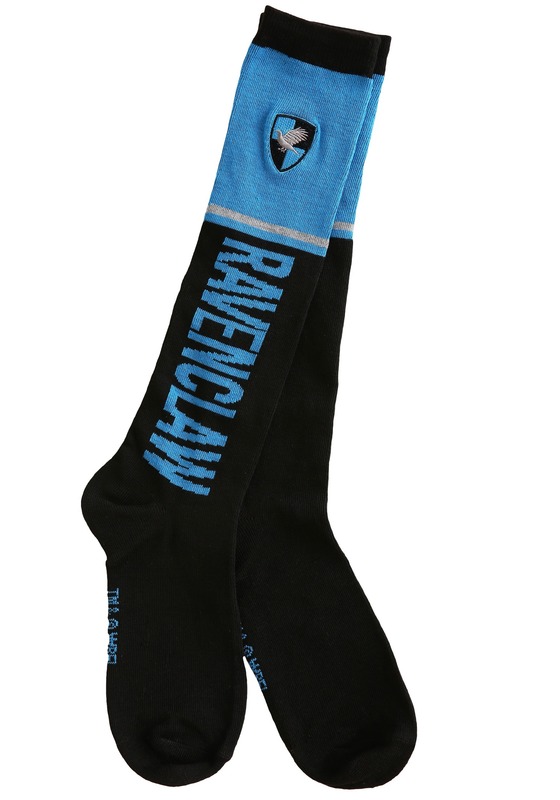 If you're headed to your first day at Hogwarts, then just slip these on to help feel prepared to join Ravenclaw. If you're a muggle, like us, then you can just put them on your feet and pretend that you just got your acceptance letter from the greatest wizard school around!